Not to be confused with George Washington University, Washington State University, or Washington University in St. Louis. 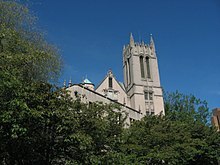 The University of Washington (commonly referred to as UW, simply Washington, or informally U-Dub) is a public research university in Seattle, Washington. Founded in 1861, Washington was first established in downtown Seattle approximately a decade after the city's founding to aid its economic development. Today, the university's 703-acre main Seattle campus is situated in the University District above the Montlake Cut, within the urban Puget Sound region of the Pacific Northwest. The university has two additional campuses in Tacoma and Bothell. Overall, UW encompasses over 500 buildings and over 20 million gross square footage of space, including one of the largest library systems in the world with over 26 university libraries, as well as the UW Tower, lecture halls, art centers, museums, laboratories, stadiums, and conference centers. The university offers bachelor's, master's and doctoral degrees through 140 departments in various colleges and schools, sees about 46,000 in total student enrollment every year, and functions on a quarter system. Washington is a member of the Association of American Universities and classified as an R1 Doctoral Research University classification under the Carnegie Classification of Institutions of Higher Education. It is cited as a leading university in the world for scientific performance and research output by the Times Higher Education World University Rankings and the CWTS Leiden Ranking. In the 2015 fiscal year, the UW received nearly $1.2 billion in research funding, the 3rd largest among all universities in the United States. As the flagship institution of the six public universities in Washington State, it is known for its research in medicine, science, as well as its highly-competitive computer science and engineering programs. Additionally, Washington continues to benefit from its deep historical ties and major collaborations with numerous technology giants in the region, such as Amazon, Boeing, Nintendo, and particularly Microsoft. Paul G. Allen, Bill Gates and others spent significant time at Washington computer labs for a prior venture before founding Microsoft. Its 22 varsity sports teams are also highly competitive, competing as the Huskies in the Pac-12 Conference of the NCAA Division I, representing the United States at the Olympic Games, and other major competitions. The University has been affiliated with many notable alumni and faculty, including 20 Nobel Prize laureates and numerous Pulitzer Prize winners, Fulbright Scholars, Rhodes Scholars, Marshall Scholars, as well as members of other distinguished institutions. The original University building, c. 1870. In 1854, territorial governor Isaac Stevens recommended the establishment of a university in the Washington Territory. Prominent Seattle-area residents, including Methodist preacher Daniel Bagley, saw this as a chance to add to the city's potential and prestige. Bagley learned of a law that allowed United States territories to sell land to raise money in support of public schools. At the time, Arthur A. Denny, an early founder of Seattle and member of the territorial legislature, aimed to increase the city's importance by moving the territory's capital from Olympia to Seattle. However, Bagley eventually convinced Denny that the establishment of a university would assist more in the development of Seattle's economy. Two universities were initially chartered, but later the decision was repealed in favor of a single university in Lewis County provided that locally donated land was available. When no site emerged, Denny successfully petitioned the legislature to reconsider Seattle as a location in 1858. In 1861, scouting began for an appropriate 10 acres (4 ha) site in Seattle to serve as a new university campus. Arthur and Mary Denny donated eight acres, while fellow pioneers Edward Lander, and Charlie and Mary Terry, donated two acres on Denny's Knoll in downtown Seattle. More specifically, this tract was bounded by 4th Avenue to the west, 6th Avenue to the east, Union Street to the north, and Seneca Streets to the south. John Pike, for whom Pike Street is named was the architect and builder. On November 4, 1861, the university opened as the Territorial University of Washington. The legislature passed articles incorporating the University, and establishing its Board of Regents in 1862. The school initially struggled, closing three times: in 1863 for low enrollment and again in 1867 and 1876 due to funds shortage. Washington successfully awarded its first graduate Clara Antoinette McCarty Wilt in 1876, with a bachelor's degree in science. By the time Washington State entered the Union in 1889, both Seattle and the University had grown substantially. Washington's total undergraduate enrollment increased from 30 to nearly 300 students, and the campus's relative isolation in downtown Seattle faced encroaching development. A special legislative committee, headed by UW graduate Edmond Meany, was created to find a new campus to better serve the growing student population and faculty. The committee eventually selected a site on the northeast of downtown Seattle called Union Bay, which was the land of the Duwamish, and the legislature appropriated funds for its purchase and construction. In 1895, the University relocated to the new campus by moving into the newly built Denny Hall. The University Regents tried and failed to sell the old campus, eventually settling with leasing the area. This would later become one of the University's most valuable pieces of real estate in modern-day Seattle, generating millions in annual revenue with what is now called the Metropolitan Tract. The original Territorial University building was torn down in 1908, and its former site now houses the Fairmont Olympic Hotel. The sole-surviving remnants of Washington's first building are four 24-foot (7.3 m), white, hand-fluted cedar, Ionic columns. They were salvaged by Edmond S. Meany, one of the University's first graduates and former head of its history department. Meany and his colleague, Dean Herbert T. Condon, dubbed the columns as "Loyalty," "Industry," "Faith", and "Efficiency", or "LIFE." The columns now stand in the Sylvan Grove Theater. 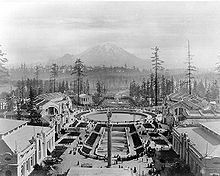 Organizers of the 1909 Alaska-Yukon-Pacific Exposition eyed the still largely undeveloped campus as a prime setting for their world's fair. They came to an agreement with Washington's Board of Regents that allowed them to use the campus grounds for the exposition, surrounding today's Drumheller Fountain facing towards Mount Rainier. In exchange, organizers agreed Washington would take over the campus and its development after the fair's conclusion. This arrangement led to a detailed site plan and several new buildings, prepared in part by John Charles Olmsted. The plan was later incorporated into the overall UW campus master plan, permanently affecting the campus layout. Both World Wars brought the military to campus, with certain facilities temporarily lent to the federal government. Regardless, subsequent post-war periods were times of dramatic growth for the University. The period between the wars saw a significant expansion on the upper campus. Construction of the Liberal Arts Quadrangle, known to students as "The Quad," began in 1916 and continued to 1939. The University's architectural centerpiece, Suzzallo Library, was built in 1926 and expanded in 1935. After World War II, further growth came with the G.I. Bill. Among the most important developments of this period was the opening of the School of Medicine in 1946, now consistently ranked as the top medical school in the United States. It would eventually also led to the University of Washington Medical Center, ranked by U.S. News and World Report to be among the top ten hospitals in the nation. Aerial view of campus, circa 1922. During this era, many Japanese Americans were sent away to internment camps along the west coast, as part of Executive Order 9066 following the attacks on Pearl Harbor. Many Japanese American students and "soon-to-be" graduates were unable to receive diplomas, or be recognized for accomplishments at the University, until Washington's commemoration ceremony for the Japanese Americans entitled The Long Journey Home, in May 2008. From 1958-1973, the University of Washington saw tremendous growth in students, faculties, operating budget, and prestige under leadership of Charles Odegaard. UW student enrollment had more than doubled to 34,000 as the baby boom generation came of age. However, this era was also marked by high levels of student activism, as was the case at many American universities. Much of the unrest focused around civil rights and opposition to the Vietnam War. In response to anti-Vietnam War protests by the late 1960s, the University Safety and Security Division became the University of Washington Police Department. Odegaard instituted a vision of building a "community of scholars", convincing the Washington State legislatures to increase their investments towards the University. Washington senators, such as Henry M. Jackson and Warren G. Magnuson, also used their political clout to build research funds for UW. The results included an operating budget increase of $37 million in 1958 to over $400 million in 1973, and solidified UW as a top recipients of federal research funds in the United States even today. Establishment of technology giants such as Microsoft, Boeing and Amazon near UW has also proved to be highly influential, not only improving graduate prospects, but also helping to attract millions of dollars in university and research funding through its extensive list of distinguished faculty and alumni network. A view of Mount Rainier from Drumheller Fountain. In 1990, the University of Washington opened additional campuses in Bothell and Tacoma. Although originally intended for students who have already completed two years of higher education, both schools have transitioned into four-year, degree-granting universities. The first freshman class for these campuses came in the fall of 2006, and both campuses now offer a selection of master's degree programs as well. In 2012, the University began exploring plans and governmental approval to expand the main Seattle campus, which includes significant increases in student housing, teaching facilities for the growing student body and faculty, as well as expanded public transit options. The UW station, completed in March 2015, connects Seattle's Capitol Hill to the UW Husky Stadium within 5 minutes of rail travel time. It represents a previously unavailable option of transportation into and out of the campus, designed specifically to reduce dependence on private vehicles, bicycles and local King County buses. The Quad, a core fixture of the campus, is lined with Yoshino cherry trees. UW's main campus is situated in Seattle, by the shores of Union and Portage Bays with views of the Cascade Range to the east, and the Olympic Mountains to the west. The site encompasses 703 acres (2.84 km2) bounded by N.E. 45th Street on the north, N.E. Pacific Street on the south, Montlake Boulevard N.E. on the east, and 15th Avenue N.E. on the west. Red Square is the heart of the campus, surrounded by landmark buildings such as Suzzallo Library, the Broken Obelisk, and the statue of George Washington. It functions as the central hub for students, and hosts a variety of events annually. University Way, known locally as "The Ave", lies nearby and is a focus for much student life at the university. The university's landmark reading room, inside Suzzallo Library. North Campus features some of UW's most recognized landscapes as well as landmarks, stretching from the signature University of Washington Quad directly north of Red Square to N.E. 45th Street, and encompasses a number of the University's most historical academic, research, housing, parking, recreational and administrative buildings. With UW's continued growth, administrators proposed a new, multimillion-dollar, multi-phase development plan in late 2014 to refine portions of the North Campus, renovating and replacing old student housing with new LEED-certified complexes, introducing new academic facilities, sports fields, open greenery, and museums. The UW Foster School of Business, School of Law, and the Burke Museum of Natural History and Culture, which houses a significant number of exhibits including a 66-million-year-old Tyrannosaurus rex fossil skull - one of only 15 known to exist in the world today and part of an ongoing excavation, are also located in North Campus. South Campus occupies the land between Pacific Street and the Lake Washington Ship Canal. The land was previously the site of the University Golf Course but was given up to construct a building for the School of Medicine. Today, South Campus is the location of UW's health sciences and natural sciences facilities, including the UW Medical Center and the Magnuson Health Sciences Center as well as locations for instruction and research in oceanography, bioengineering, biology, genome sciences, hydraulics, and comparative medicine. The East Campus area stretches east of Montlake Boulevard to Laurelhurst and is largely taken up by wetlands and Huskies sports facilities and recreation fields, including Husky Stadium, Hec Edmundson Pavilion, and Husky Ballpark. While the area directly north of the sports facilities is home to UW's computer science and engineering programs, which includes computer labs once used by Paul G. Allen and Bill Gates for their prior venture before establishing Microsoft, the area northeast of the sports facilities is occupied by components of the UW Botanic Gardens, such as the Union Bay Natural Area, the UW Farm, and the Center for Urban Horticulture. Further east is the Ceramic and Metal Arts Building and Laurel Village, which provides family housing for registered full-time students. East Campus is also the location of the UW light rail station. West Campus consists of mainly modernist structures located on city streets, and stretches between 15th Avenue and Interstate 5 from the Ship Canal, to N.E. 41st Street. It is home to the College of Built Environments, School of Social Work, Fishery Sciences Building, UW Police Department as well as many of the University's residence halls and apartments, such as Stevens Court, Mercer Court, Alder Hall and Elm Hall. The Gothic-revival Gerberding Hall houses offices, including that of the President and Provost. University of Washington's President Ana Mari Cauce was selected by the Board of Regents, effective October 13, 2015. On November 12, 2015 the Board of Regents approved a five-year contract for Cauce, awarding her yearly compensation of $910,000. Cauce's compensation package includes an annual salary of $697,500, $150,000 per year in deferred compensation, an annual $50,500 contribution into a retirement account, and a $12,000 annual automobile allowance. She was the Interim President prior to her appointment, fulfilling the position left vacant by the previous President Michael K. Young when he was announced to be Texas A&M University's next President on February 3, 2015. Phyllis Wise, who had served at UW as Provost and Executive Vice President, and as Interim President for a year, was named the Chancellor of the University of Illinois at Urbana–Champaign in August 2011. The University is governed by ten Regents, one of whom is a student. Its most notable former regent is likely William H. Gates, Sr., the father of Bill Gates. The undergraduate student government is the Associated Students of the University of Washington (ASUW) and the graduate student government is the Graduate and Professional Student Senate (GPSS). In 2017 the University reported $4.893 billion in revenues and $5.666 billion in expenses, resulting in an operating loss of $774 million. This loss was offset by $342 million in state appropriations, $443 million in investment income, $166 million in gifts, and $185 million of other non-operating revenues. Thus, the University's net position increased by $363 million in 2017. Endowed gifts are commingled in the University's Consolidated Endowment Fund, managed by an internal investment company at an annual cost of approximately $6.2 million. The University reported $443,383,000 of investment income in fiscal year 2017. As of 31 December 2017[update] the value of the CEF was $3.361 billion, with $686 million in Emerging Markets Equity, $1.235 billion in Developed Markets Equity, $383 million in Private Equity, $185 million in Real Assets, $54 million in Opportunistic, $535 million in Absolute Return, and $283 million in Fixed Income. Major recent spending includes $131 million on the UW Animal Research and Care Facility, $72 million on the Nano-engineering and Sciences Building, $61 million building on the Workday HR & Payroll System, $50 million on the Denny Hall Renovation, $44 million on the West Campus Utility Plant, $26 million on the UW Medical Center Expansion Phase 2, $25 million on the UW Tacoma Urban Solutions Center, and $21 million on the UW Police Department. The initial contract for Workday was for $27 million, so the total $61 million cost represents a $34 million cost overrun. As of 28 April 2018[update], the University has nearly $1 billion in new construction underway. Environmental sustainability has long been a major focus of the University's Board of Regents and Presidents. In February 2006, the UW joined a partnership with Seattle City Light as part of their Green Up Program, ensuring that all of Seattle campus' electricity is supplied by and purchased from renewable sources. In 2010, then UW President Emmert furthered the University's efforts with a host of other universities across the U.S., and signed the American College & University Presidents' Climate Commitment. UW created a Climate Action Team, as well as an Environmental Stewardship Advisory Committee (ESAC) which keeps track of UW's greenhouse gas emissions and carbon footprint. Policies were enacted with environmental stewardship in mind, and institutional support was provided to assist with campus sustainability. Additionally, UW's Student Housing and Food Services (HFS) office has dedicated several million dollars annually towards locally produced, organic, and natural foods. HFS also seized the use of styrofoam containers on-campus, and instead opted for compostable cups, plates, utensils, and packaging whenever possible. New residence halls planned for 2020 are also expected to meet silver or gold LEED standards. Overall, the University of Washington was one of several universities to receive the highest grade, "A-", on the Sustainable Endowments Institute's College Sustainability Report Card in 2011. The University was one of 15 Overall College Sustainability Leaders, among the 300 institutions surveyed. The University offers bachelor's, master's and doctoral degrees through its 140 departments, themselves organized into various colleges and schools. It also continues to operate a Transition School and Early Entrance Program on campus, which first began in 1977. UW is a globally recognized flagship university, as reflected in its strong performance across global rankings. It has been listed as a "Public Ivy" in Greene's Guides since 2001, and is an elected member of the American Association of Universities. Among the faculty by 2012, there have been 151 members of American Association for the Advancement of Science, 68 members of the National Academy of Sciences, 67 members of the American Academy of Arts and Sciences, 53 members of the Institute of Medicine, 29 winners of the Presidential Early Career Award for Scientists and Engineers, 21 members of the National Academy of Engineering, 15 Howard Hughes Medical Institute Investigators, 15 MacArthur Fellows, 9 winners of the Gairdner Foundation International Award, 5 winners of the National Medal of Science, 7 Nobel Prize laureates, 5 winners of Albert Lasker Award for Clinical Medical Research, 4 members of the American Philosophical Society, 2 winners of the National Book Award, 2 winners of the National Medal of Arts, 2 Pulitzer Prize winners, 1 winner of the Fields Medal, and 1 member of the National Academy of Public Administration. Among UW students by 2012, there were 136 Fulbright Scholars, 35 Rhodes Scholars, 7 Marshall Scholars and 4 Gates Cambridge Scholars. UW is recognized as a top producer of Fulbright Scholars, ranking 2nd in the US in 2017. The Academic Ranking of World Universities (ARWU) has consistently ranked UW as one of the top 20 universities worldwide every year since its first release. In 2017, UW ranked 13th worldwide out of 500 by the ARWU, 25th worldwide out of 981 in the Times Higher Education World University Rankings, and 26th worldwide out of 101 in the Times World Reputation Rankings. Meanwhile, QS World University Rankings ranked it 61st worldwide, out of over 900. Other nationally competitive UW graduate programs include statistics at 7th, pharmacy and education at 9th, engineering at 25th, business at 27th, and law at 30th — also referred to as a competitive "Tier 1" school. As for other rankings: In 2010, Top American Research Universities, published by The Center for Measuring University Performance of Arizona State University, ranked the University of Washington 11th among the top 50 American universities. In 2011, UW was ranked 8th globally among 2,000 universities in University Ranking by Academic Performance (URAP) published by Middle East Technical University. Top 200 Colleges and Universities in the World, published by 4 international colleges and universities, ranked UW at 8th globally in 2012. In 2017, the Leiden Ranking, which focuses on science and the impact of scientific publications among the world's 500 major universities, ranked UW 12th globally and 5th in the US. Washington is also recognized in more specific domains. In 2012, the Wall Street Journal's SmartMoney named UW 6th best in salary returns on tuition. In 2014, Kiplinger magazine's "Best Values in Public Colleges" named UW 11th for in-state students, and 28th for out-of-state students. In 2012, the U.S. Peace Corps ranked UW 2nd among large U.S. universities, based on the number of undergraduate alumni serving as volunteers. In the Washington Monthly National University Rankings, UW was ranked 8th domestically in 2017. The University's undergraduate admissions process is rated 91/99 by the Princeton Review meaning highly selective, and is classified "more selective" by the U.S. News & World Report. For Fall 2016, 19,733 were accepted out of 43,517 applications. Among the 6,475 admitted freshman students who then officially enrolled for Fall 2016, SAT scores averaged 1840, out of 2400. More specifically, the middle 50% ranged from 610-700 for evidence-based reading and writing, and 600–740 for math. ACT composite scores for the middle 50% ranged from 26–32, out of 36. The middle 50% of admitted GPA ranged from 3.68–3.94, typically out of 4.0. The University uses capacity constrained majors, a gate-keeping process that requires most students to apply to an internal college or faculty. New applications are usually considered once or twice annually, and few students are admitted each time. The screening process is often stringent, largely being based on cumulative academic performance, recommendation letters and extracurricular activities. Capacity constrained majors have been criticized for delaying graduation and forcing good students to reroute their education. In April 2018, the University began to collaborate with students to address these problems and improve University access for all. As a large flagship university, UW's research budget consistently ranks among the top 5 in both public and private universities in the United States. It surpassed the $1.0 billion research budget milestone in 2012, and university endowments reached almost $3.0 billion by 2016. UW is the largest recipient of federal research funding among public universities, and currently ranks top 2nd among all public and private universities in the nation. In 2014, teams from the University of Washington School of Oceanography and the UW Applied Physics Laboratory successfully completed construction of the first high-power underwater cabled observatory in the United States. To promote equal academic opportunity, especially for people of low income, UW launched Husky Promise in 2006. Families of income up to 65 percent of state median income or 235 percent of federal poverty level are eligible. With this, up to 30 percent of undergraduate students may be eligible. The cut-off income level that UW set is the highest in the nation, making top quality education available to more people. Then UW President, Mark Emmert, simply said that being "elitist is not in our DNA". "Last year, the University of Washington moved to a more comprehensive approach [to admissions], in which the admissions staff reads the entire application and looks at grades within the context of the individual high school, rather than relying on computerized cutoffs." UW was the host university of ResearchChannel program (now defunct), the only TV channel in the United States dedicated solely for the dissemination of research from academic institutions and research organizations. Participation of ResearchChannel included 36 universities, 15 research organizations, two corporate research centers and many other affiliates. University of Washington had 46,081 total enrollments as of Autumn 2016, making it the largest university on the west coast by student population in spite of its selective admissions process. It also boasts one of the most diverse student bodies within the US, with approximately 33% of its undergraduate students being members of minority groups. The Husky Union Building, one of many facilities for student resources. The Dream Project: "The Dream Project teaches UW students to mentor first-generation and low-income students in King County high schools as they navigate the complex college-admissions process." The Rural Health Education (RHE): Promotes health in rural areas of Washington state through health fairs. Volunteers include students from a variety of backgrounds including: medical, pharmacy, and dentistry. Health professionals from the Greater Seattle area also actively participate. Students Expressing Environmental Concern (SEED): partially funded by UW's Housing and Food Services (HFS) office to promote environmental sustainability, and reduce the university's carbon footprint. Student Philanthropy Education Program: Partnered with the UW's nonprofit, the UW Foundation, this group focuses on promoting awareness of philanthropy's importance through major events on campus. Husky Global Affairs: This is a club dedicated to social science research in global issues. It provides a forum for students to collaborate in research and publishes their research in the Global Affairs Journal. UW Delta Delta Sigma Pre-Dental Society (DDS): This is a club dedicated to serving pre-dental students and it provides a forum for discussion of dental related topics. UW Earth Club: The Earth Club is interested in promoting the expression of environmental attitudes and consciousness through specialized events. UW Farm: The UW farm grows crops on campus and advocates urban farming in the UW community. GlobeMed at UW: a student-run non-profit organization that works to educate about global poverty and its effect on health. The UW chapter is a part of a national network of chapters, each partnering with a grassroots organization at home or abroad. GlobeMed at UW is partnered with The MINDS Foundation which supports education about and treatment for mental illness in rural India. UW Sierra Student Coalition: SSC is dedicated to many larger environmental issues on campus and providing related opportunities to students. Washington Public Interest Research Group (WashPIRG): WashPIRG engages students in a variety of activism causes, including environmental projects on campus and the community. UW Tower, a conference space and administrative building. The Associated Students of the University of Washington (ASUW) is one of two Student Governments at the University of Washington, the other being the Graduate and Professional Student Senate. It is funded and supported by student fees, and provides services that directly and indirectly benefit them. The ASUW employs over 72 current University of Washington students, has over 500 volunteers, and spends $1.03 million annually to provide services and activities to the student body of 43,000 on campus. The Student Senate was established in 1994 as a division of the Associated Students of the University of Washington. Student Senate is one of two official student governed bodies and provides a broad-based discussion of issues. Currently, the ASUW Student Senate has a legislative body of over 150 senators representing a diverse set of interests on and off campus. The ASUW was incorporated in the State of Washington on April 20, 1906. On April 30, 1932 the ASUW assisted in the incorporation of University Book Store which has been in continuous operation at the same location on University Way for over 70 years. The ASUW Experimental College, part of the ASUW, was created in 1968 by several University of Washington students seeking to provide the campus and surrounding community with a selection of classes not offered on the university curriculum. The student newspaper is The Daily of the University of Washington, usually referred to as The Daily. It is an award-winning publication, and it is the second largest daily paper in Seattle. The Daily is published every day classes are in session during fall, winter and spring quarters, and weekly during summer quarters. In 2010, The Daily launched a half-hour weekly television magazine show, "The Daily's Double Shot," on UWTV Channel 27. The UW continues to use its proprietary UWTV channel, online and printed publications. The faculty also produce their own publications for students and alumni. UW offers many services for its students and alumni, beyond the standard offered by most colleges and universities. Its "Student Life" division houses 16 departments and offices that serve students directly and indirectly, including those below and overseen by Vice President and Vice Provost. The University operates one of the largest campuses of any higher education institution in the world. Despite this, growing faculty and student count has strained the regional housing supply as well as transportation facilities. Starting in 2012, UW began taking active measures to explore, plan and enact a series of campus policies to manage the annual growth. In addition to new buildings, parking and light rail stations, new building construction and renovations have been scheduled to take place through 2020. The plan includes the construction of three six-story residence halls and two apartment complexes in the west section of campus, near the existing Terry and Lander Halls, in Phase I, the renovation of six existing residence halls in Phase II, and additional new construction in Phase III. The projects will result in a net gain of approximately 2,400 beds. The Residence Hall Student Association (student government for the halls) is the second largest student organization on campus and helps plan fun events in the halls. For students, faculty, and staff looking to live off-campus, they may also explore Off-Campus Housing Affairs. The Greek System at UW has also been a prominent part of student culture for more than 115 years. It is made up of two organizational bodies, the Interfraternity Council (IFC) and the Panhellenic Association. The IFC looks over 34 fraternities with 1900+ members and Panhellenic consists of 19 sororities and 1900 members. The school has additional Greek organizations that do not offer housing and are primarily special interest. In addition to the University of Washington's Disability Resources for Students (DRS) office, there is also a campus-wide DO-IT (Disabilities, Opportunities, Internetworking, and Technology) Center program that assists educational institutions to fully integrate all students, including those with disabilities, into academic life. DO-IT includes a variety of initiatives, such as the DO-IT Scholars Program, and provides information on the 'universal' design of educational facilities for students of all levels of physical and mental ability. These design programs aim to reduce systemic barriers which could otherwise hinder the performance of some students, and may also be applied to other professional organizations and conferences. UW students, sports teams, and alumni are called Washington Huskies, and often referred to metonymically as "Montlake," due to the campus's location on Montlake Boulevard N.E. (although the traditional bounds of the Montlake neighborhood do not extend north of the Montlake Cut to include the campus.) The husky was selected as the school mascot by the student committee in 1922, which replaced the "Sun Dodger", an abstract reference to the local weather. The University participates in the National Collegiate Athletic Association's Division I-A, and in the Pac-12 Conference. The football team is traditionally competitive, having won the 1960 and 1991 national title, to go along with eight Rose Bowl victories and an Orange Bowl title. From 1907 to 1917, Washington football teams were unbeaten in 64 consecutive games, an NCAA record. Tailgating by boat has been a Husky Stadium tradition since 1920 when the stadium was first built on the shores of Lake Washington. The Apple Cup game is an annual game against cross-state rival Washington State University that was first contested in 1900 with UW leading the all-time series, 65 wins to 31 losses and 6 ties. College Football Hall of Fame member Don James is a former head coach. The Hec Edmundson Pavilion hosts basketball and volleyball events. The men's basketball team has been moderately successful, though recently the team has enjoyed a resurgence under coach Lorenzo Romar. With Romar as head coach, the team has been to six NCAA tournaments (2003–2004, 2004–2005, 2005–2006, 2008–2009, 2009–2010 and 2010–2011 seasons), 2 consecutive top 16 (sweet sixteen) appearances, and secured a No. 1 seed in 2005. On December 23, 2005, the men's basketball team won their 800th victory in Hec Edmundson Pavilion, the most wins for any NCAA team in its current arena. Rowing is a longstanding tradition at the University of Washington dating back to 1901. The Washington men's crew gained international prominence by winning the gold medal at the 1936 Summer Olympics in Berlin, defeating the German and Italian crews much to the dismay of Adolf Hitler who was in attendance. In 1958, the men's crew deepened their legend with a shocking win over Leningrad Trud's world champion rowers at the Moscow Cup, resulting in the first American sporting victory on Soviet soil, and certainly the first time a Russian crowd gave any American team a standing ovation during the Cold War. The men's crew have won 46 national titles (15 Intercollegiate Rowing Association, 1 National Collegiate Rowing Championship), 15 Olympic gold medals, two silver and five bronze. The women have 10 national titles and two Olympic gold medals. In 1997, the women's team won the NCAA championship. The Husky men are the 2015 national champions. Recent national champions include the softball team (2009), the men's rowing team (2015, 2014, 2013, 2012, 2011, 2009, 2007), NCAA Division I women's cross country team (2008), and the women's volleyball team (2005). Individually, Scott Roth was the 2011 NCAA men's Outdoor Pole Vault and 2011 & 2010 NCAA men's Indoor Pole Vault champion. James Lepp was the 2005 NCAA men's golf champion. Ryan Brown (men's 800 meters) and Amy Lia (women's 1500 meters) won individual titles at the 2006 NCAA Track and Field Championships. Brad Walker was the 2005 NCAA men's Outdoor and Indoor Pole Vault champion. The University has an extensive series of sports facilities, including but not limited to the Husky Stadium (football, track and field), the Alaska Airlines Arena at Hec Edmundson Pavilion (basketball, volleyball, and gymnastics), Husky Ballpark (baseball), Husky Softball Stadium, The Bill Quillian Tennis Stadium, The Nordstrom Tennis Center, Dempsey Indoor (Indoor track and field, football) and the Conibear Shellhouse (rowing). The golf team plays at the Washington National Golf Club and until recently, the swimming team called the Weyerhaeuser Aquatic Center and the Husky pool home. The University discontinued its men's and women's swim teams on May 1, 2009, due to budget cuts. The rebuilt Husky Stadium, in 2016. The rebuilt Husky Stadium is the first and primary source of income for the completely remodeled athletic district. The major remodel consisted of a new grand concourse, underground light-rail station which opened on March 19, 2016, an enclosed west end design, replacement of bleachers with individual seating, removal of track and Huskytron, as well as the installation of a new press box section, private box seating, football offices, permanent seating in the east end zone that does not block the view of Lake Washington. The project also included new and improved amenities, concession stands, and bathrooms throughout. The cost for renovating the stadium was around $280 million, and was designed for a slightly lower seating capacity than its previous design, now at 70,138 seats. Besides hosting national and regional football games, the Husky Stadium is also used by the University for its annual Commencement event, departmental ceremonies, and other events. Husky Stadium is one of several places that may have been the birthplace of the crowd phenomenon known as "The Wave". It is claimed that the wave was invented by Husky graduate Robb Weller and UW band director Bill Bissel in October 1981, for an afternoon game facing opponents from Stanford University. The costumed mascot, Harry the Husky, at a basketball game. The University of Washington Husky Marching Band performs at many Husky sporting events including all football games. The band was founded in 1929, and today it is a cornerstone of Husky spirit. The band marches using a traditional high step, and it is one of only a few marching bands left in the United States to do so. Like many college bands, the Husky band has several traditional songs that it has played for decades, including the official fight songs "Bow Down to Washington" and "Tequila", as well as fan-favorite "Africano". Notable alumni of the University of Washington include U.S. Olympic rower Joe Rantz (1936); architect Minoru Yamasaki (1934); news anchor and Big Sky resort founder Chet Huntley (1934); US Senator Henry M. Jackson (JD 1935); Baskin & Robbins co-founder Irv Robbins (1939); former actor, The Hollywood Reporter columnist and TCM host Robert Osborne (1954); glass artist Dale Chihuly (BA 1965); Serial Killer Ted Bundy; Pulitzer Prize-winning author Marilynne Robinson (PhD 1977), martial artist Bruce Lee; saxophonist Kenny G (1978); MySpace co-founder Chris DeWolfe (1988); actor Rainn Wilson (BA, Drama 1986); and actor and comedian Joel McHale (1995, MFA 2000). ^ Buhain, Venice (May 25, 1999). "But what does it mean?". The Daily. Archived from the original on July 19, 2014. Retrieved December 24, 2014. ^ As of December 31, 2017. "Quarterly Investment Performance Report As of December 31, 2017" (PDF). University of Washington. 2017. ^ a b "Fast Facts: 2018". University of Washington. ^ "Colors". University of Washington. Retrieved December 3, 2016. ^ "Dub" being a phonetic shorthand for "W" ("double-you"). ^ a b "Entering a Golden Age of Innovation in Computer Science". March 9, 2017. Retrieved April 10, 2018. ^ "Olympians - Washington Rowing". Washington Rowing. Retrieved April 2, 2018. ^ Banel, Feliks (October 8, 2012). "Founding The University Of Washington, One Student At A Time". KUOW.org. KUOW-FM. Retrieved December 30, 2017. ^ "CHS Re:Take - Pike's place on Capitol Hill". January 15, 2017. ^ "The University of Washington's Early Years". No Finer Site: The University of Washington's Early Years On Union Bay. University Libraries. University of Washington. Retrieved April 29, 2015. ^ "University of Washington". Great Depression in Washington State Project. ^ "The Black Student Union at UW: Black Power on Campus". Seattle Civil Rights and Labor History Project. ^ Kindig, Jesse. "Student Activism at UW, 1948–1970". Seattle Civil Rights and Labor History Project. ^ "UW Police Department: History". Retrieved August 20, 2012. ^ "Top Colleges in Tech | Paysa Blog". www.paysa.com. Retrieved August 3, 2017. ^ Hess, Abigail (July 26, 2017). "Here's how much education you need to work at top tech companies". Retrieved August 3, 2017. ^ "About the Gates family | Give to the UW". www.washington.edu. Retrieved August 1, 2017. ^ "University Link light-rail service starts March 19". The Seattle Times. January 26, 2016. Retrieved August 1, 2017. ^ Keeley, Sean (March 17, 2016). "UW & Capitol Hill Light Rail Stations Are Ready". Curbed Seattle. Retrieved August 1, 2017. ^ Lyttle, Bethany. "University of Washington, Seattle, Wash. - pg.5". Forbes. Retrieved April 10, 2018. ^ "Housing Master Plan - UW HFS". hfs.uw.edu. Retrieved April 10, 2018. ^ Long, Katherine (October 10, 2014). "UW plan to raze old dorms, raise rents in new ones worries students". seattletimes.com. Retrieved April 10, 2018. ^ "Burke Museum team discovers a T. rex". Burke Museum. August 17, 2016. Retrieved April 10, 2018. ^ "Researchers excavate T. rex skull at UW's Burke Museum". KING. Retrieved April 10, 2018. ^ "As visitors watch, Burke Museum preps its T. rex exhibit". Spokesman.com. Retrieved April 10, 2018. ^ "Our Back Pages: The UW Golf Course". www.washington.edu. ^ "Office of the President". www.washington.edu. Retrieved November 2, 2015. ^ "UW Regents approve contract for President Ana Mari Cauce". UW News. Retrieved May 10, 2018. ^ "Regents: Two-time university president expected to serve at helm of Texas A&M". theeagle.com. February 3, 2015. Retrieved February 3, 2015. ^ "Biography – Phyllis Wise". University of Illinois. Retrieved October 7, 2012. ^ a b c d e "2017 Bondholder Report" (PDF). ^ University of Washington Investment Management Company. "University of Washington Quarterly Investment Performance Report" (PDF). ^ "New UW payroll system behind schedule, more costly than expected". The Seattle Times. November 26, 2015. Retrieved May 10, 2018. ^ "UW has $1 billion in buildings going up or planned in Seattle". The Seattle Times. April 29, 2018. Retrieved May 10, 2018. ^ "Mayor Announces UW Green Energy Purchase". City of Seattle. February 2006. ^ "Who's Who". American College & University. Presidentsclimatecommitment.org. Archived from the original on July 26, 2009. Retrieved September 16, 2010. ^ Roseth, Robert (February 5, 2009). "UW seeks to deepen its commitment to sustainability". Retrieved September 16, 2010. ^ "About the Environmental Stewardship Advisory Committee (ESAC)" (PDF). Environmental Stewardship Advisory Committee. August 10, 2004. Archived from the original (PDF) on March 5, 2009. Retrieved September 16, 2010. ^ "Environmental Stewardship Advisory Committee". University of Washington. Archived from the original on May 17, 2008. Retrieved May 21, 2008. ^ "Housing and Food Services: Environmental Stewardship and Sustainability". University of Washington. Archived from the original on July 25, 2010. ^ "College Sustainability Report Card 2008". Sustainable Endowments Institute. Retrieved May 21, 2008. ^ "UW again receives grade of A- for sustainability". September 26, 2008. Retrieved September 16, 2010. ^ "Academic Departments". University of Washington. Retrieved September 16, 2010. ^ "The Halbert and Nancy Robinson Center for Young Scholars". Retrieved May 24, 2009. ^ Greene, Howard; Greene, Matthew W. (2001). Public Ivies. Greenes' Guide to Educational Planning. HarperCollins. ISBN 9780060934590. ^ "Association of American Universities". Retrieved March 16, 2012. ^ "Faculty & Staff, University of Washington". 2012. ^ University of Washington. "Faculty Memberships and Awards". Archived from the original on May 31, 2012. Retrieved June 10, 2012. ^ Trujillo, Joshua (May 7, 2010). "Crown Princess Victoria of Sweden honors local Nobel Laureates". The Seattle Post Intelligencer. Retrieved October 8, 2012. ^ "Future Students, University of Washington". 2012. ^ "University of Washington is a top producer of Fulbright scholars Students". 2018. ^ "Academic Ranking of World Universities——University of Washington". ^ "World Reputation Rankings 2016". Times Higher Education. ^ "U.S. News Best Graduate Schools". U.S. News & World Report. Archived from the original on February 23, 2017. Retrieved October 1, 2015. ^ "2010 Top American Research Universities Report" (PDF). Archived from the original (PDF) on January 16, 2013. Retrieved June 30, 2012. ^ "Ranking by Academic Performance 2011, Middle East Technical University". Urapcenter.org. Retrieved June 30, 2012. ^ Cairns, Eva. "University Rankings: How Important Are They?". Forbes. Retrieved August 14, 2017. ^ "Leiden Ranking 2017 by Leiden University". Leidenranking.com. Retrieved October 7, 2017. ^ "SmartMoney College Rankings" (PDF). SmartMoney. Retrieved December 2, 2012. ^ Best Values in Public Colleges (2014). Kiplinger. ^ "Peace Corps Top Colleges 2012" (PDF). Archived from the original (PDF) on February 27, 2012. Retrieved June 30, 2012. ^ "National University Rankings 2017" (PDF). Washingtonmonthly.com. September 8, 2017. ^ "The Princeton Review's College Ratings | The Princeton Review". www.princetonreview.com. Retrieved August 4, 2017. ^ "University of Washington - The Princeton Review College Rankings & Reviews". www.princetonreview.com. Retrieved August 4, 2017. ^ "University of Washington". U.S. News & World Report. Retrieved January 11, 2015. ^ a b c d "University of Washington Quick Facts". University of Washington. Archived from the original on June 28, 2012. ^ "UW Fast Facts: 2017" (PDF). University of Washington - Office of Planning and Budgeting. Retrieved April 3, 2018. ^ "Capacity-constrained majors". Retrieved April 18, 2018. ^ "Applying for a capacity-constrained major?". Archived from the original on April 19, 2018. Retrieved April 18, 2018. ^ "UW Undergraduate Advising: Majors and Minors". Retrieved April 18, 2018. ^ "University of Washington Annual Report 2005" (PDF). Retrieved June 30, 2012. ^ "The Top American Research Universities (December 2005)". Mup.asu.edu. Archived from the original on June 17, 2012. Retrieved June 30, 2012. ^ "UW passed $1 billion research budget mark". Uwnews.washington.edu. Archived from the original on May 31, 2012. Retrieved June 30, 2012. ^ As of June 30, 2016. "U.S. and Canadian Institutions Listed by Fiscal Year (FY) 2016 Endowment Market Value and Change in Endowment Market Value from FY 2015 to FY 2016" (PDF). National Association of College and University Business Officers and Commonfund Institute. 2017. Archived from the original (PDF) on April 2, 2017. ^ Jaschik, Scott (October 13, 2006). "Inside HigherEd Husky Promise". Insidehighered.com. Retrieved June 30, 2012. ^ "UW Husky Promise". Depts.washington.edu. October 11, 2006. Retrieved June 30, 2012. ^ "Education News - College Admissions, MBA Programs, Financial Aid - Wsj.com". Collegejournal.com. Retrieved June 30, 2012. ^ "ResearchChannel contact UW". Archived from the original on June 21, 2006. ^ "ResearchChannel participants". Archived from the original on August 29, 2006. ^ "University of Washington Quick Stats" (PDF). UW Office of the Registrar. Archived from the original (PDF) on January 12, 2015. Retrieved April 23, 2014. ^ See Washington (state)#Demographics and Demographics of the United States for references. ^ "Office of Admissions. 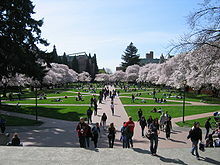 University of Washington". Admit.washington.edu. May 1, 2012. Archived from the original on June 28, 2012. Retrieved June 30, 2012. ^ Shelley, Anthony (April 24, 2007). "UW admissions more competitive". The Daily of the University of Washington. Archived from the original on July 7, 2012. ^ "UW Dream Project | Supporting Seattle-area high school students through the college admissions process". Washington.edu. June 28, 2013. Retrieved January 13, 2014. ^ "Student Organizations". Retrieved September 16, 2010. ^ "Associated Students of the University of Washington | SAF | Services and Activities Fee". depts.washington.edu. Retrieved November 9, 2015. ^ "History". senate.asuw.org. Archived from the original on November 17, 2015. Retrieved November 9, 2015. ^ "Corporations Division". Washington Secretary of State. Retrieved October 28, 2011. ^ "UWTV". UWTV. Retrieved June 30, 2012. ^ "Campus Master Plan | Capital Planning and Development". cpd.uw.edu. Retrieved August 1, 2017. ^ "Off-Campus Housing Affairs". ASUW. Archived from the original on December 15, 2004. ^ "Universal Design: Process, Principles, and Applications". Washington.edu. June 14, 2012. Retrieved June 30, 2012. ^ "Applications of Universal Design to Projects, Conference Exhibits, Presentations, and Professional Organizations". Washington.edu. Retrieved June 30, 2012. ^ Thiel, Art (January 21, 2007). "Mora's move generates intrigue". Seattle Post-Intelligencer. Retrieved September 16, 2010. ^ "2014 NCAA Football Record Book" (PDF). NCAA. p. 117. Retrieved October 17, 2014. ^ Raley, Dan (December 21, 1999). "Events of the century". Seattle Post Intelligencer. Retrieved October 8, 2012. ^ Johns, Greg (August 23, 2007). "Huskies crew earns return trip to Moscow". Seattle PI. Retrieved July 7, 2012. ^ Thiel, Art (September 4, 2007). "UW crew gets front seat to history". Seattle PI. Retrieved July 7, 2012. ^ Water World, Sports Illustrated, November 17, 2003. ^ a b Raley, Dan (April 30, 2003). "Crew: UW's most successful, stable athletic enterprise". Seattle PI. Retrieved July 7, 2012. ^ Condotta, Bob (May 2, 2009). "Huskies | UW cuts swimming teams | Seattle Times Newspaper". Seattletimes.com. Retrieved January 13, 2014. ^ "University Link light-rail service starts March 19". The Seattle Times. January 26, 2016. Retrieved May 6, 2016. ^ "School Colors: Purple and Gold". CBS Interactive. Archived from the original on December 10, 2010. Retrieved July 8, 2012. ^ "University Chronology". University of Washington. Retrieved July 8, 2012. ^ "The Changeling (1980)". The New York Times. Retrieved July 7, 2012. ^ "Filming Locations for WarGames". International Movie Database. Retrieved October 8, 2012. ^ Maslin, Janet (September 18, 1992). "Singles (1992) Review/Film; Youth, Love and a Place of One's Own". The New York Times. Retrieved July 7, 2012. ^ Van Gelder, Lawrence (March 28, 1997). "The Sixth Man (1997) Hoop Dreams and (Ghostly) Schemes". The New York Times. Retrieved July 7, 2012. ^ Holden, Stephen (March 31, 1999). "10 Things I Hate About You (1999) FILM REVIEW; It's Like, You Know, Sonnets And Stuff". The New York Times. Retrieved July 7, 2012. ^ "Movie – What the Bleep!? Down the Rabbit Hole (2006)". Retrieved October 8, 2012. ^ Scott, A.O. (October 26, 2007). "A Family Just Like Yours (if You Lived in a Movie)". The New York Times. Retrieved July 7, 2012. ^ "Movie filming on University of Washington campus". King 5 News. August 29, 2011. Archived from the original on October 15, 2012. Retrieved October 8, 2012. 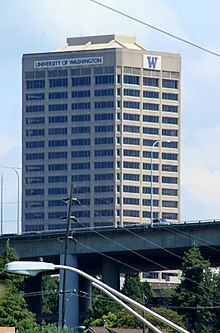 Wikimedia Commons has media related to University of Washington. 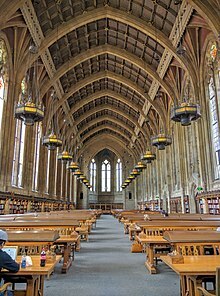 Wikisource has the text of a 1905 New International Encyclopedia article about University of Washington. University of Washington Libraries Digital Collections – Calvin F. Todd Photographs Collection includes images from 1905 to 1930 of the University of Washington campus and scenes from Seattle including the waterfront, various buildings especially apartments, regrading activities, and the Pike Place Market. University of Washington Libraries Digital Collections – University of Washington Campus Photographs Photographs reflecting the early history of the University of Washington campus from its beginnings as the Territorial University through its establishment at its present site on the shores of Lake Washington. The database documents student activities, buildings, departments, and athletics. "Washington, University of" . Collier's New Encyclopedia. 1921. This page was last edited on 23 April 2019, at 20:12 (UTC).